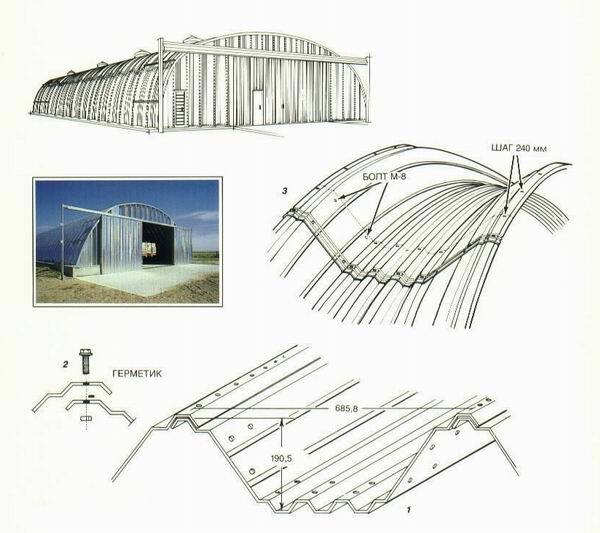 Feature of design of WSB type building is the unified folded shell arch element with deep profiling, which at the same time serves as a carrying and protecting design element providing the whole building dead load considerably decreasing, as well as erection term, that is the basic advantage in comparison with traditional building designs. 1 - The dimension of the panel, when components are assembled. 2 - The interlocking design of arches provides the tight and durable joint, and using of sealers elliminates the moisture getting into the building. 3 - The high range of standartization has made it possible to use only two types of splise details.